It may not be summer in many parts of the world at this particular moment in time, but somewhere it is and always it comes, like the rain and the sun and….taxes. For our four-legged friends, getting out into the sun is usually a limited experience on leashes or closed in yards. Consider the joy and exhilaration in the hearts of our dogs and cats as they enjoy taking in a few laps, lying in the sun, sipping pretty blue drinks with little umbrellas and applying suntan lotion. 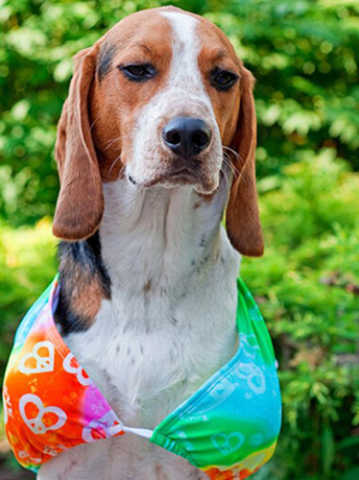 But what does the well-dressed pet wear to the beach? Aye, there is the rub or the suit, or something like that. 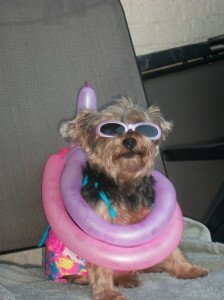 Here are a few suggestions taken by some of our most chic four legged sun worshippers. Follow us now, not to those days of yesteryear when the Lone Ranger rode with Silver and Tonto, but rather to the sun drenched lawns and backyard pools of suburbia and a seashore gracefully dotted with adorable animals surfing and sun bathing in bathing suits! pretending not to notice us. Independent gals who lead double lives as beloved Chihuahuas, make their own fashion statements when it comes to the beach and bathing suits. Check out this coordinated Chiquita below. 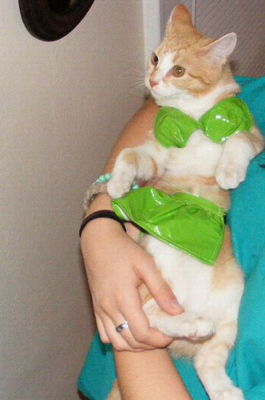 Dressing up our pets as we would ourselves can have unexpected repercussions. It can possibly lead to a very human condition known as complacency. If you don’t believe that can happen, take a look at this star struck pooch about to have her close-up with Mr. DeMille. I’m off to the beach. Tell my fans I’ll sign autographs later. 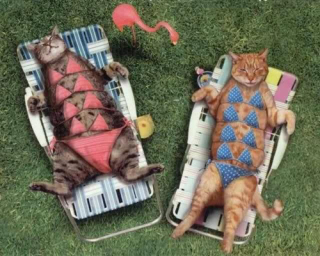 Cats and dogs love the shore even though making a fashion statement is the last thing on any of their minds. It is more about the play-time and bonding that appeals to our furry friends. Artists over the years have depicted dogs and cats in beachwear enjoying the sun but the reality is that the beach represents one big playground with lots of new sensations, things and people to play with. Can't I swim naked like other animals? 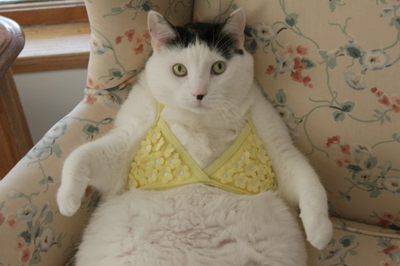 She wore an itsy-bitsy teeny-weeny yellow polka dot bikini. illustrated below, can it go too far? 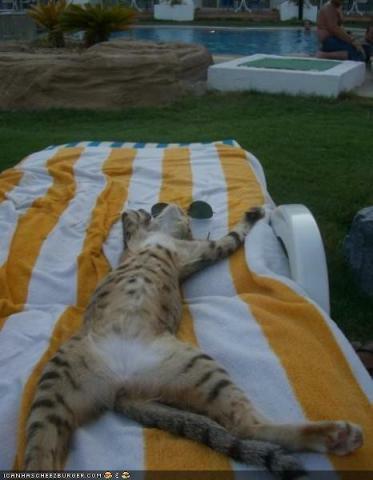 Help, everyone’s left for the beach and I’ve fallen and I can’t get up! Animals prepare themselves in their own way for whatever is to come. Their perspective may be mysterious and misunderstood but it is, after all, contingent on their view of things. 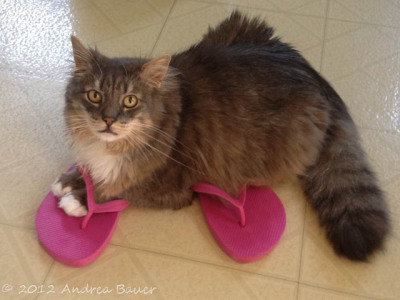 Consider this feline below who prepares for the beach in her own special way. and these are more appropriate for the beach anyway. Cats care about the world in which they live in their own inimitable fashion. They are proud to display their green intentions even if they have little or no Irish blood. Consider this one below. I am ecologically aware and sustainable as well as beautiful! Sometimes not being prepared isn’t an animal’s fault. Every once in a while, an owner forgets something important, here and there. Consider Tallulah below. I can’t go to the beach today! This suit has no bottom. 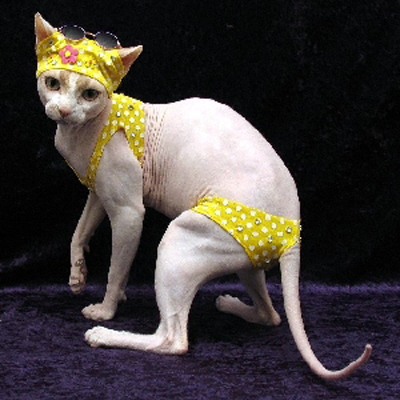 Of course, we can’t forget the down home cat with simple tastes who can’t be confined by the restrictions of a bathing suit, but loves to sunbathe au natural. Hiram here is still included in this mix because he is so adamant about his obvious feelings about fashion statements and bathing suits. Are those birds serenading me, or am I dreaming? In summation, take your pet to the beach even if you can’t convince him or her to wear a suit. You never know what your pet may find. Get matching suits; maybe that will sway their feelings about them. In any case, turn beach time into play time for you and your beloved pet. Mission Impossible Squirrel: Action Animal Video of the Day!